Well, probably not really. Not anymore. We could, however, use some good gin to go along with that stogie. Not that we don't have a passable gin down here. I've become attracted to Old Master Gin, but my favorite for years has been Bombay Sapphire. But that's not what I want to write about this morning. Strange to lead off with an aside... or did I get distracted coming out of the chute? Whatever. Anyway, I remember, some years ago, when we were first here in Belize, we ended up staying in a total of four different places. There was Tony and Nellie's house in Ranchito for six months, then came Canadian Bob's duplex on Gringo Lane where we stayed for a month, followed by Jim and Melanie's Thatch-roofed Trinity House, also on Gringo Lane for two or three months, and finally our own place, Casa Winjama, on Ferry Road (officially 'A' Street, South - but nobody knows it as that). We did all that with all of our possessions in tow too. Conex boxes or shipping containers that you see on cargo ships and on semi trailers were almost non- existent back then - at least to keep for the long-term. We certainly couldn't find any. What we did manage to find was a great diesel truck, split-axle, and with an 18-foot box on the back that served as our storage container. It moved from place to place with us. If we had found a Conex box, we'd have been dealing with a whole different situation than we had. We either would have had to hire a guard to stay with it, if we placed it on our property, because at that time, we were out in the bush with no nearby neighbors on our side of the canal, or we would have had to drag it somehow from place to place. Which would have meant that we would also have had to hire a trailer for the thing, just so we could move it. The truck was a much better idea. What would have been an even better idea was if there was someplace to rent where we could actually store our stuff, that was protected, and that we could get into periodically when we needed something out of one box or the other. Unfortunately , at the time, there was nothing like that up here. There was one or two places down in Belize City, but that would have been less than handy for our purposes. Things change and for the better. 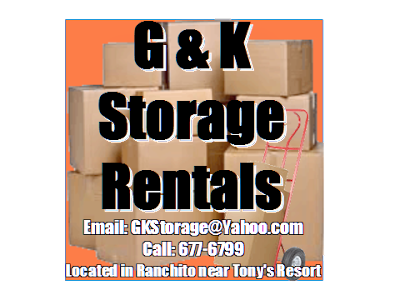 The Corozal area now has a storage rental place - G & K Storage Rentals. Run by a nice couple, Gina and Keith, from North Carolina. We got to know them at our Friday pool party. They've been here for a year or so, and have been working hard to get their place up and running. They have a Mennonite house built by the same folks who built ours, John and Franz Weibe, out of Shipyard. The storage facilities, with lockable roll-up doors, occupy the ground floor of their place, with their house as the second story - just like ours. Their place is located on the south-end of Corozal, just west of Tony's Inn and Beach Resort, on the next road paralleling Almond Drive. Their phone number is 677-6799, or Email them at gkstorage@yahoo.com. They're a great resource to have after all these years. Did your computer (or other electronic device) suffer an early death done there? Or are you just taking a break while waiting for something else to break? Anyhow... hope all is well! I'll tell you, this has been the time for everything to break. The Isuzu's back in the shop (the joke is that Rick let's me use it once in a while), Dianna's laptop likewise, I had to rebuild the well pressure tank, and on and on it goes. You know, I blame it all on global warming... that's what it is. At least the toaster is still working. Speaking of a break, I need one. Well, it doesn't look like things are getting any better down there -- at least based on your lack of time off to update the blog. Wow, I thought things were going to pieces up here but I didn't realize it had crept down there also. Hope to hear from you soon -- with some good news, like maybe that you sold the Isuzu, got more dogs and now pull a small wagon all over Corozal. Oh, and the new phrase up here is "Climate Change", since they found out world average temperature has gone down over the last 100 years! Good luck and look forward to hearing from weather station Corozal again. Some things never change. The Isuzu lives up at Rick's more or less permanently now. It's been almost six weeks since we've had a vehicle. I still have high hopes... I've forgotten what for now. The weather station will be back up in April sometime.